Do you feel like laundry is one thing that has a life of its own in your home? One minute the dirty laundry basket is almost empty, then you blink and it is overflowing with two and a half loads? When our kids were younger (like last week), they would sometimes put their clean laundry in the dirty laundry basket instead of putting it away. Whenever I noticed this, I pulled out all of those items and gave them back to the child or children who thought this was an easy solution. I am not about to wash clean clothes! Laundry is one household task that comes up frequently in conversations with my friends. Some of them do all the laundry by themselves: they wash, dry, sort, and fold all of the family’s laundry. I used to do this, too, until I stopped doing it. Here I am going to share the simple solution that makes laundry a lot easier at our house: I don’t do it all myself. I am going to let you in on a truth (it shouldn’t be a secret): kids can take care of their own laundry. Each month one of our children is the designated laundry helper. We rotate chores each month so each child has a turn to help. He or she will help with starting a load of laundry in the washing machine, transferring it to the drier, taking it out, and carrying it into the house. We then put the laundry basket full of clean laundry in our family room. We do not have a laundry room in our home. Our washer and dryer are in the garage, so we keep two laundry baskets inside the house where all of us can place our dirty clothes. We wash everyone’s laundry together. As our children have gotten older, it is so nice to be able to ask them to start a load in the washing machine or get a load out of the drier by themselves. They have been taught what to do are old enough to do the laundry witout help. Grab your clothes and a towel! This is my favorite part of laundry and what has been a sanity and time saver for me. Once the laundry basket full of clean laundry is in the family room, our laundry helper or I tell everyone else that there is clean laundry. Everyone takes out their own clothes and at least one towel, folds them, and puts them away. I have been known (more than once) to wait on dinner until this is done so that we do not have clothes hanging out in the family room for d-a-y-s. Again. Kids can do their own laundry. Yes! Kids can do their own laundry. This is not a myth. When our kids were told and shown that they were responsible for this, they took on the task. The younger ones saw the older ones taking care of their clothes, so it made sense for them to take care of theirs, too. Are their clothes folded neatly? Not always. Do our kids put their clothes away rather than put them on their beds or on the floor of their bedrooms? Not always. (Thus the clean clothes in the laundry baskets sometimes.) Are they learning to be responsible for their own things? Yes. 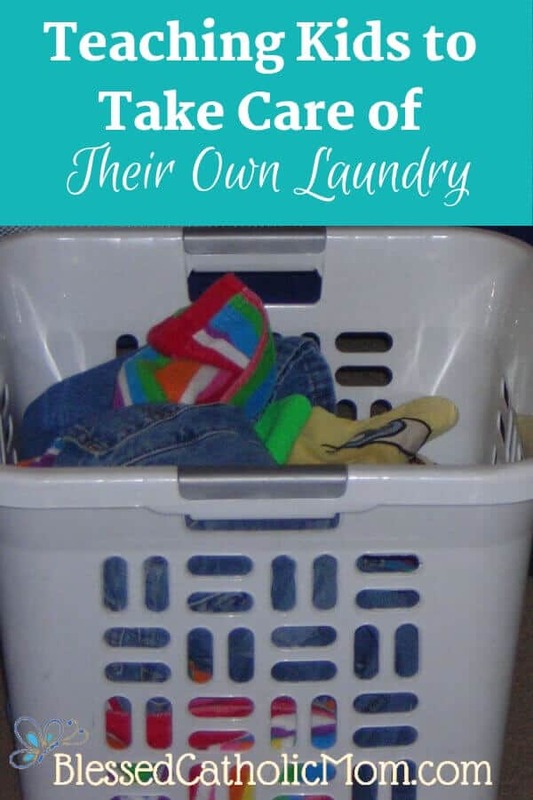 Have I given up being a perfectionist about laundry with our kids? Yes. 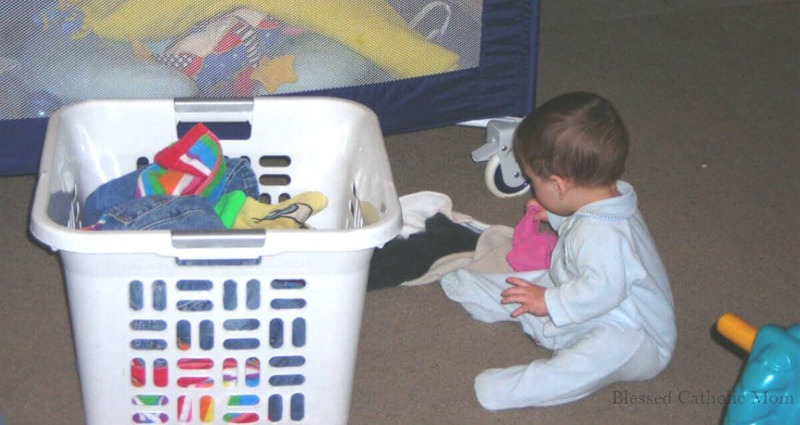 Tips to help young kids with their laundry. Teach kids how to find their clean clothes. This one is easy because they will recognize their own clothes in a basket of laundry. I will sit on the couch with the laundry basket beside me and pull out the items one at a time. When our child recognized his own clothes, I put them in a pile. The rest of the clothes go in another pile on the couch. When we have gone through the load, I’ll put all of the other clothes back into the basket so we have room to fold his clothes on the couch. 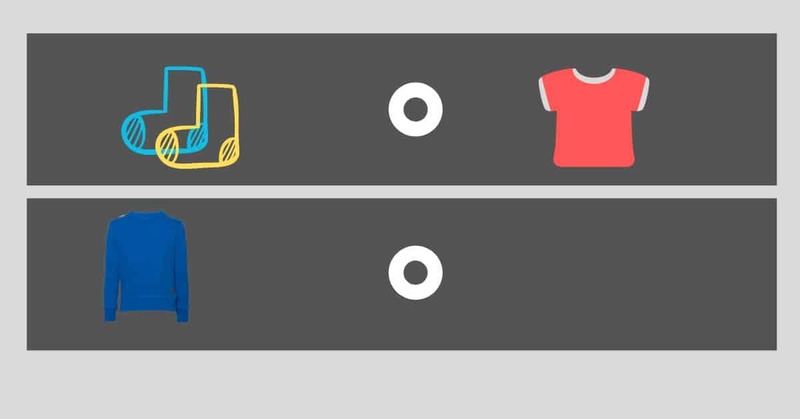 Help and teach kids to fold their clothes. I will tell my child to pick up one of his items from the pile. I will pick a similar item. We will lay them out side by side and I will show him how to fold it. I will fold one and he will fold the other, copying me. Then we stack them together. We work side by side until all of his clothes are folded. Help kids put away their clothes. One tip that really helped when our kids started folding and putting away their own laundry was to have paper cut-outs on their drawers to show what clothes went in what drawers. For example, we had paper cut-outs for t-shirts, shorts, long sleeved shirts, pants, pajamas, and socks on their drawers so they would know what clothes went in what drawers. 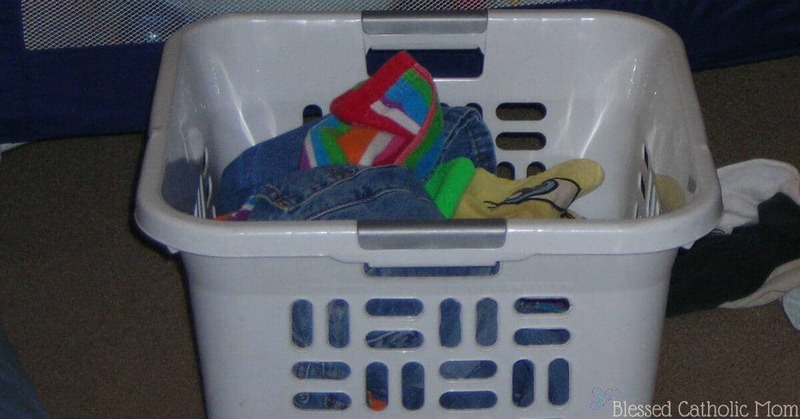 Using this system helped them to not feel overwhelmed with taking care of their own laundry. They knew where their clothes went and could put them away by themselves after we folded them. Sometimes our kids would just put things away wherever they wanted to put them, but when they could not find that favorite shirt since it was not in their shirt drawer, they (eventually) learned the importance of putting things away where they belonged! Following this system also made getting dressed easier, since we all knew what clothes were where. I used to get frustrated when our kids and I would neatly fold their clothes and then they would just dump them on their bed in a messy pile instead of put them away as they had been taught. But, I learned to let go. For me, there were more important things to think about than perfectly folded clothes or perfectly organized drawers, so I chose to let go of my own expectations about neatly folded laundry put away in an organized way. Besides, when it came time for a bedtime story and the bed had a pile of laundry on it, they had to put it all away first. Tell your friends: kids can do their own laundry. Since we have all been sorting, folding, and putting away our own laundry, I have felt less frustration and resentment. It is no longer all on me to do. Our kids are learning responsibility for their own things and learning skills (like how to do laundry) that will benefit them in the future. What about you? Do you have a laundry routine in place? Will you tweak your current system to get everyone more involved? Make a plan and follow through.